With this unique software, you check out the ClickBank products by visiting their pitch pages within the built in browser, or yours, by category; this is the mode 1. The Mode 2 allows you to check out all the recently added products, by keyword, sorted by decreasing rank. 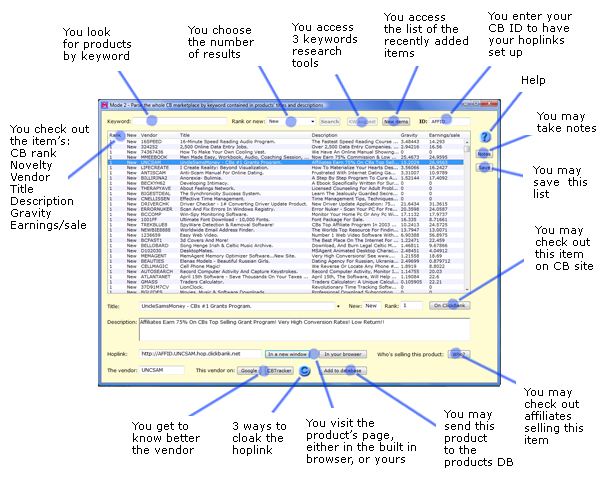 You manage all the products you promote, with the help of the first embedded database (DB). You manage all your CB accounts, that you log into from within the second embedded DB. You check out the marketing strategies of the vendors and their affiliates!!! You access whois tools to get more infos about the vendors, and any site you visit. You create and cloak your hoplinks; and create your hop ads. You may save and manage every list of results.